2018 can be marked as the year of notch among the Android community. Essential actually kickstarted it since late 2017, but 2018 made it to another level – even accompanied by a ‘notch gate’. Oh, and the battle royale genre: games like PlayerUnknown’s Battlegrounds (PUBG) or Fortnite are on fire, especially among mobile users. Essentially, two worlds collided: compatibility issues with display notches started to bug PUBG players. OEMs like Xiaomi, Nokia or OnePlus came up with their own set of optimizations to deal with the notch, until Google incorporated it inside Android’s codebase in a standardised manner. Now the ball is in the court of the app developers, Tencent Games, the developer of PUBG mobile is supposed to bring device specific compatibilities. But Poco F1 users are still reporting (example: here, here) bugs with the notch while playing PUBG after Android Pie update. Alvin Tse, the Head of Pocophone Global, has now entered into the scene. According to one of their recent tweets, they have already contacted Tencent Games to bring necessary compatibility as Xiaomi strictly maintains Google requirement about notches in Android Pie. Hi there this is because PUBG developer is being compatible with Google's Android Pie requirements. We have emailed them and you can help by emailing them too to support this back in Pie. Elvin has also started another thread, asking PUBG Mobile developers to bring support for notched phones, such as Poco F1, running Android Pie. Numerous Poco F1 users have started to assemble there and are raising their voice since then. #POCOF1 users, please retweet this thread to @PUBGMOBILE if you want them to support full screen in Pie. Thanks all. We reached out to Google to see if they could offer a statement on the situation. While Google was unable to offer a comment on what exactly happened with the Nokia 6.1 Plus, a Google spokesperson confirmed to us that the Android One program does NOT prevent device makers from adding a notch hiding feature. Furthermore, there is NO Google requirement that prevents device makers from adding such a feature. There are cases where Google may ask device makers to adjust the implementation of their software features, however. This may happen if a feature interferes with application compatibility, causing an app to not work as the developer intended. All such cases are covered under Google’s Android compatibility requirements, which has no mention of a notch hiding feature. While there are third party solutions to deal with the notch (example), users are certainly expecting an integrated solution. 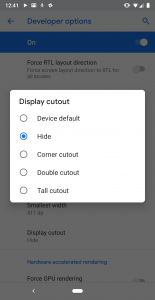 Are you facing notch bugs on your Poco while playing PUBG? Let us know by commenting below.